The massive namesake of “Space Battleship Yamato 2202” joins the SOUL OF CHOGOKIN series! It’s packed with features, including light-up Wave Motion Gun, engine, and bridge, plus motorized turrets. A remote control lets you play key lines recorded by the voice actors for Susumu Kodai and Yuki Mori, plus a variety of other effects and music. 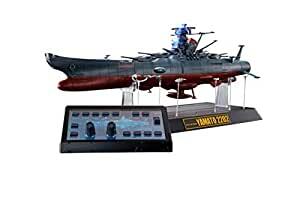 The set includes the Yamato itself, a remote control, eight miniature fighters (Cosmo Zero, Tiger I, Tiger II (x2), Tsvarke, Cosmo Seagull, and “Ki” type search craft), detachable wings, rocket anchors (L/R), display stand, display stand arm set, and test batteries.